So the people marched through London, the people spoke at the rallies and the idiots did their very best to disrupt and dilute the message. What little message there was anyway. The idea of the Leader of the Opposition speaking at a trade union rally seems odd especially when that person has to reach out to all those dissafected by the current government. Thus it is quite odd to see Labour party leader Ed Milliband take such an overt risk. Douglas Alexander must have bluffed his way into managing Labour electoral strategy again. In the end it ended in farce. As Ed was comparing the march to that of the civil rights and Apartheid movements UK Uncut militants were breaking through police cordons and racing for the heart of London’s retail district: Oxford Circus. 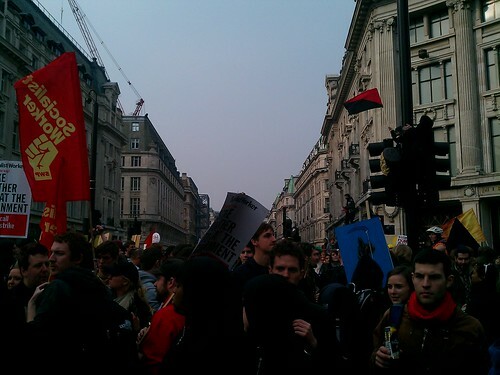 By the time I popped by to see what was going on the whole Oxford Street/Regent Street area was full of protesters. The atmosphere was jovial and relaxed to be honest. That was at about 4PM when I headed off. After that though things apparently turned sour and scuffles between police and protesters broke out in Picadilly Circus and later Trafalgar Square. Scuffles which later turned into an outright battle. All this either completely eclipsed Milliband’s speech or served to tie him ever closer to the militant left. 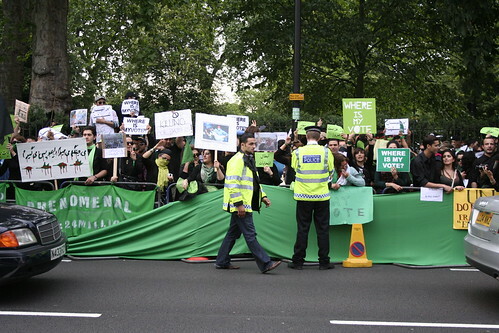 There are people who say that the media overemphasises the effect of roughly 0.8 – 1% – trust me there were more than 0.08% of the 300k who took part out in Oxford/Regent Street – who were bad eggs out of the overall batch of protesters. A pro-government bias trying to hide the impact of 300,000 odd protesters and pushing the austerity agenda. That may be true but let us look at the facts. Today direct action brought most of the West End to a standstil, confused and frightened tourists and ordinary people alike, caused thousands of pounds worth of damage and resulted in tens of people and policemen injured. This happened. This comes at a time when both sides claim that Britain is with them, that they want to unite Britain and that their opponents seek to divide Britain. Actually Britain politically has never been more divided in living memory. 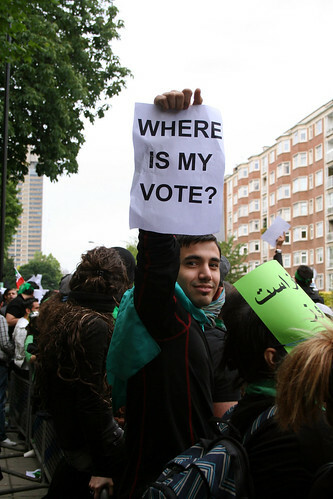 Britain may support the cuts but they are split down the middle over how they intend to vote. Reading up on Twitter after I found a computer and started uploading my cheesy pics and video I was reading the usual left or right bilge but the comparisons with the uprisings in the Middle East made my stomach turn. People were seriously comparing what was happening at Trafalgar Square with Tahir Square in Cairo! This alone tells me just how much in denial some people are. Slightly overcast yesterday outside the Iranian Embassy at Princes Gate, London but that wasn’t dampening the mood not one bit. A large crowd of a couple of thousand took part in what was a well organised , good natured and generally well run demonstration. They had been given a strip of road and part of the pavement but not once did I see anyone do anything other than chant and shout their outrage at what was going on within Iran. The police were helpful, polite and spent most of the time standing marvelling at the scene. They even had a translator on hand to smooth out any possible faux pas that might have ocurred. The only problems in the end appeared to be one small boy who had lost his Mum and two or three incompetent Anarchist protesters who were quickly moved on by the protest organisers. All in all a success. I manged to take a fair few photos which were pretty good I think and the protest was well received by people driving by with many of them hooting their digust at the Iranian government.